This dish has great depth of flavor despite being very healthy and pleasantly light. 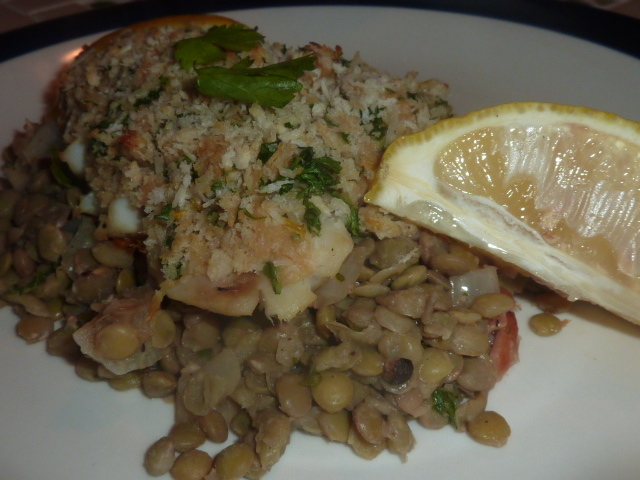 The earthy flavors of the lentils, onion, and bacon pair really well with the bright flavors of the parsley and lemon zest in the cod. There’s not very much hands on time for this dish, but the flavors feel like it was really labored over. The bacon lentils are also really delicious cold or at room temperature (which is why I made plenty of leftovers for lunch, since class starts back up again tomorrow). In a small bowl, mix together 1/2 cup panko, parsley, lemon zest, olive oil, 1 tbs. mustard, kosher salt and freshly cracked black pepper. Stir throughly to combine. Using a pastry brush, brush each fillet of cod with remaining mustard, then season with salt and pepper. Press the panko mix on top of each fillet, about 1″ thick. Top each fillet with another tsp. or so of plain Japanese panko crumbs each. Spray tops lightly with non-stick cooking spray. Spray an oven proof skillet with non-stick cooking spray and heat until very hot over medium-high heat. Add the cod fillets and sear 3-4 minutes. Transfer the pan to the oven for 5-7 minutes, until the cod is nearly cooked through and the panko is a light golden brown. Remove from the oven and loosely cover with foil. Allow to rest for 5 to 10 minutes. Serve with lemon wedges. Place lentils, bay leaves, kosher salt, and whole black peppercorns into a large saucepan and cover with water by 2-3″. Bring to a rolling boil over medium-high heat and then reduce heat to low. Cover and simmer until lentils are tender, about 25-30 minutes. Drain any remaining liquid, discarding bay leaves and, if desired, peppercorns. In a medium sauté pan, cook bacon until crispy over medium-high heat. Remove bacon and set aside on some paper towels to drain. Once cooled and drained, roughly chop. Meanwhile, add onion and garlic to to rendered bacon fat. Cook until onion is translucent and cooked through, roughly 6-8 minutes. In a medium mixing bowl, whisk together red wine vinegar, mustard, parsley, coriander, bacon pieces, onion, garlic, and lentils. Serve warm. It’s been ridiculously hot here in Cleveland, so I was looking for a quick, simple meal that had at least one cool component to balance out any heat. This dish satisfied both requirements and ended up fresh, bright, and extremely tasty. Rinse cod fillets and season with kosher salt and freshly cracked black pepper. Allow the fish to sit in the refrigerator 30 minutes to 1 hour to evaporate any excess moisture. 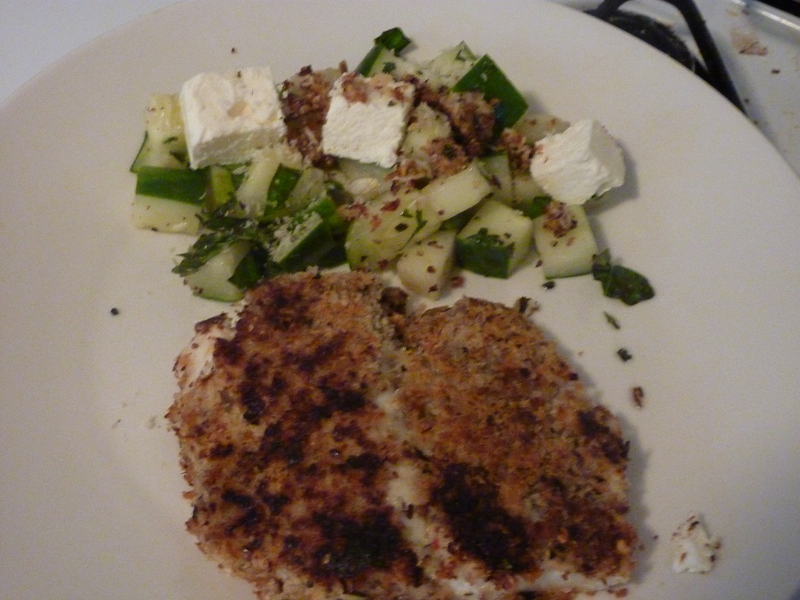 Combine panko, dried sweet basil, dried dill, garlic powder and crushed red pepper. Combine Dijon mustard and olive oil. Roll fish in mustard/olive oil mixture until coated, then roll in panko. Spray large sauté pan with cooking spray and heat over medium-high heat. Add fish and sauté 3-4 minutes per side, depending on thickness of fillets, until crust is golden brown and fish is cooked through. Combine cucumber, salt, pepper, dried sweet basil and dried parsley. Whisk together olive oil and red wine vinegar to form a vinaigrette. Add vinaigrette to cucumber mix and allow to cool in refrigerator 1-2 hours until chilled through and flavors have melded. Top with squares of feta.